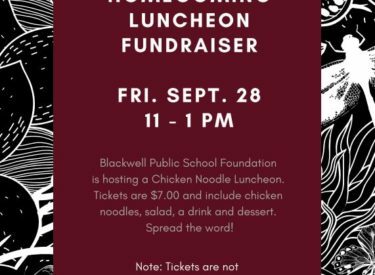 Blackwell Public School Foundation will host the Annual Homecoming Luncheon on Friday, Sept. 28th from 11 a.m. to 1 p.m. at the Kay Room, 300 West Doolin. Tickets are on sale at the School Central Office, BancFirst, Central National Bank, RCB Bank, and the Blackwell Chamber of Commerce office. Buy your tickets now — they are not guaranteed at the door.